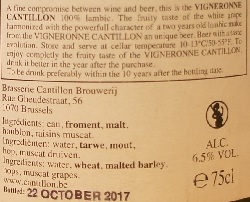 Brewer Description: (from bottle) A fine compromise between wine and beer, this is the Vigneronne Cantillon 100% lambic. 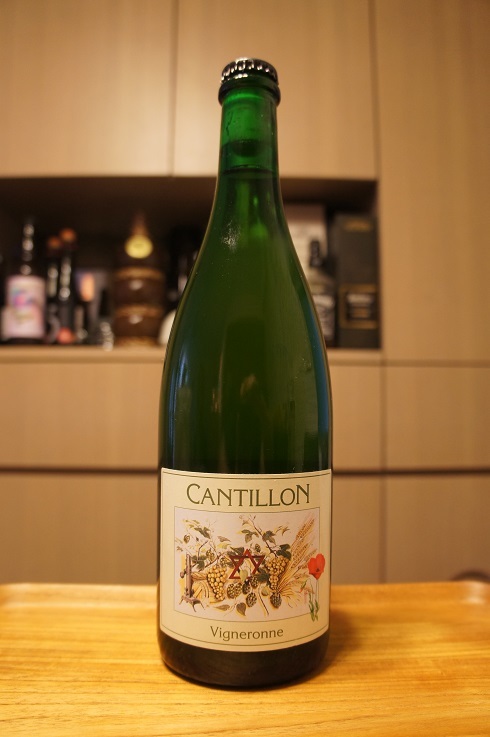 The fruity taste of the white grape harmonized with the powerful character of a two year old lambic make from the Vigneronne Cantillon an unique beer. Beer with a taste evolution. Store and serve at cellar temperature 10-13°C/50-55°F. 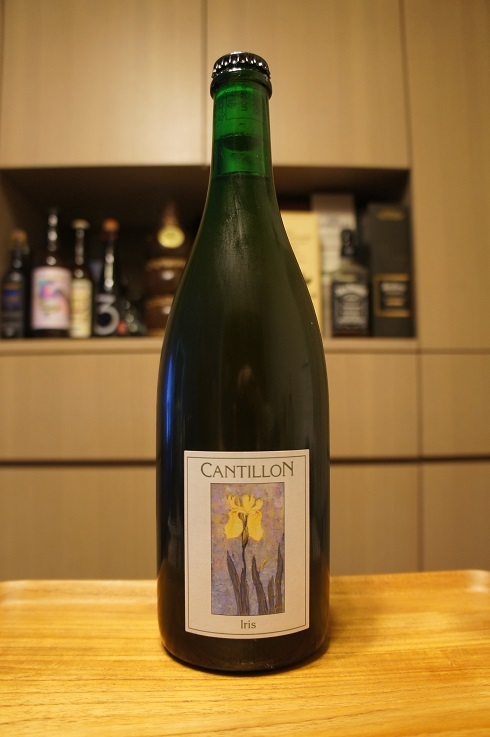 To enjoy completely the fruity taste of the Vigneronne Cantillon, drink it better in the year after purchase. To be drunk preferably within the 10 years after the bottling date. Intro: A 750ml bottle, bottled on 22nd October 2017. Poured into a Cantillon ballon glass. Appearance: A lightly hazy golden colour with a less than one finger white head that dissipated fairly quickly while leaving some nice lacing. Aroma: Tart, white grape, grape skin, peach, apricot, pear, lemon, oak, wet hay with light funk. Taste: Sour, tart, sweet green grapes, peach, pear, lemon, oak and moderate funk. Overall: Really tasty and excellent as is. It’s only been bottled for less than a year, but I think extra time in the bottle does it wonders. 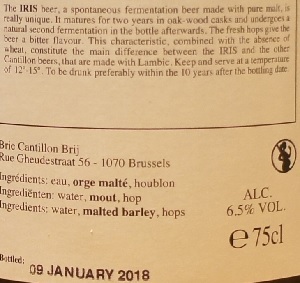 Brewer Description: (from bottle) The Iris beer, a spontaneous fermentation beer made with pure malt, is really unique. It matures for two years in oak-wood casks and undergoes a natural second fermentation in the bottle afterwards. The fresh hops gives the beer a bitter flavour. 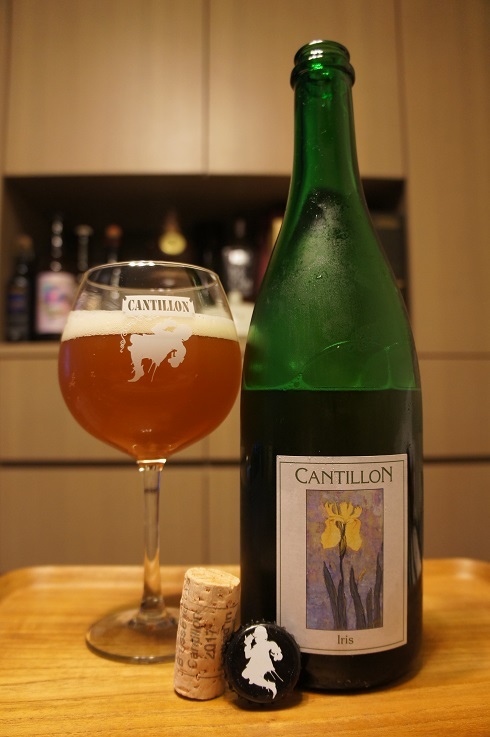 This characteristic, combined with the absence of wheat, constitute the main difference between the Iris and the other Cantillon beers, that are made with Lambic. Keep and serve at a temperature of 12°-15°. To be drunk preferably within the 10 years after the bottling date. Intro: A 750ml corked and capped bottle, bottled on 9th January 2018. 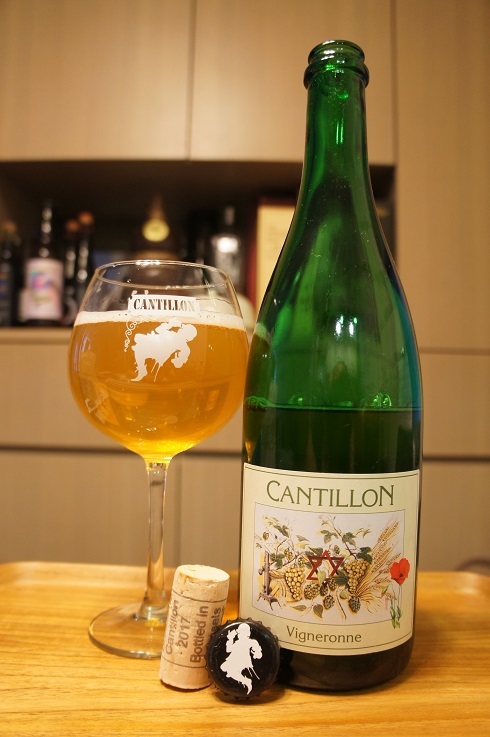 Poured into a Cantillon ballon glass. Appearance: A lightly hazy golden orange colour with a one and a half finger off white head that dissipates fairly quickly to a thin layer, while leaving some sparse lacing. Aroma: Tart, funky barnyard, oak, apricot, grapefruit, citrus zest and rind. Taste: Sour, lightly bitter, a hint of sweetness, funk, oak, apricot, peach, grapefruit zest, lemon and leather with a hint of floral and herbal. Mouthfeel: Medium bodied with moderate to low carbonation. Overall: Very enjoyable and great to drink. Even better when aged properly for a few years. 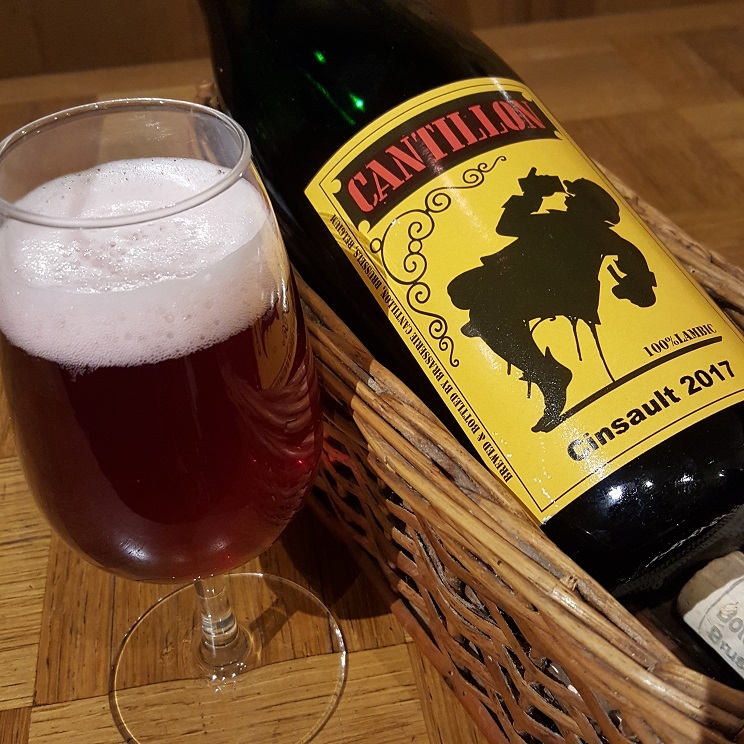 Brewer Description: Not much information I can find, but as far as I can gather, Fruit Lambic made with Cinsault grapes. Intro: A 750ml bottle at the brewery, 2017 vintage. Poured into a Cantillon taster glass. Appearance: A clear ruby purple red colour, with a one finger pinkish head that dissipated fairly quickly and left sparse to no lacing. Aroma: Lightly tart, red wine, grape and strawberries. Taste: Lightly sour and tart, lots of red wine qualities, grape, strawberry and mixed berries. Mouthfeel: Medium to light bodied with low carbonation. Overall: As close to red wine as I’ve ever tried in a beer. Good aromas and flavour. 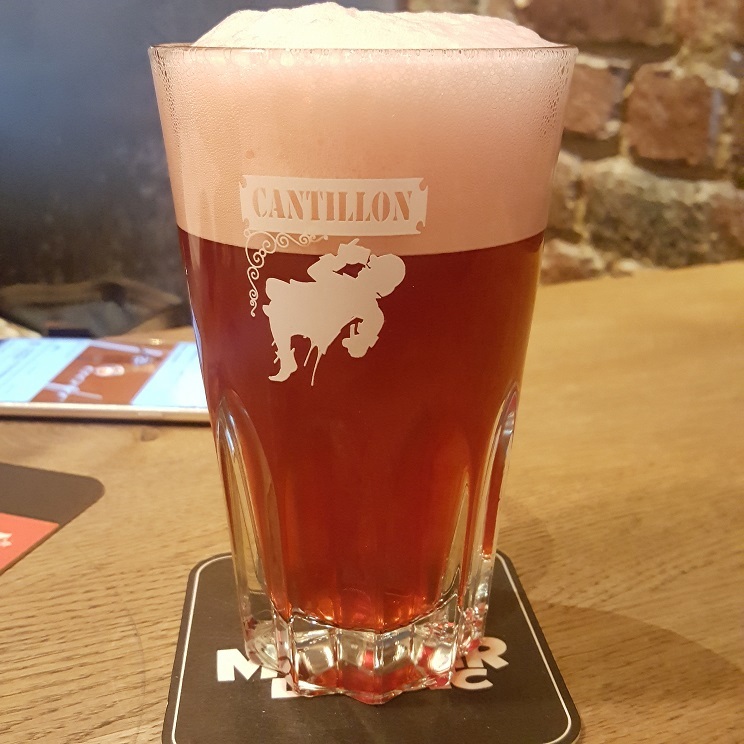 Brewer Description: (from lambic.info) Cantillon Cuvée Moeder is a kriek blend made specifically for the two Moeder Lambic bars in Brussels. 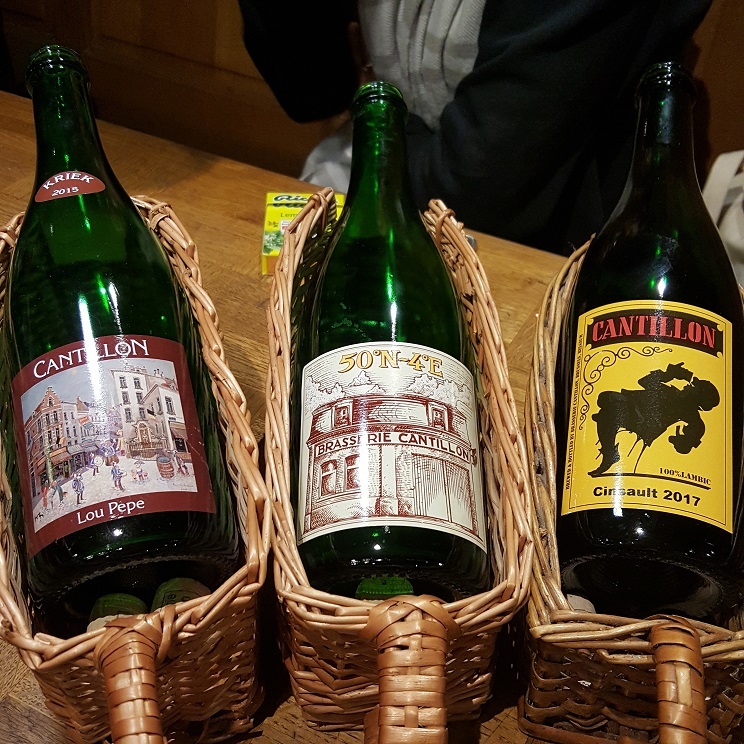 Whereas Cantillon Kriek contains 200 grams per liter of Turkish cherries and the Lou Pepe Kriek contains 300 grams per liter (g/l) of Schaerbeekse cherries, this unique kriek blend is made with of 200 grams per liter of Turkish cherries and 100 grams per liter of Schaerbeekse cherries. 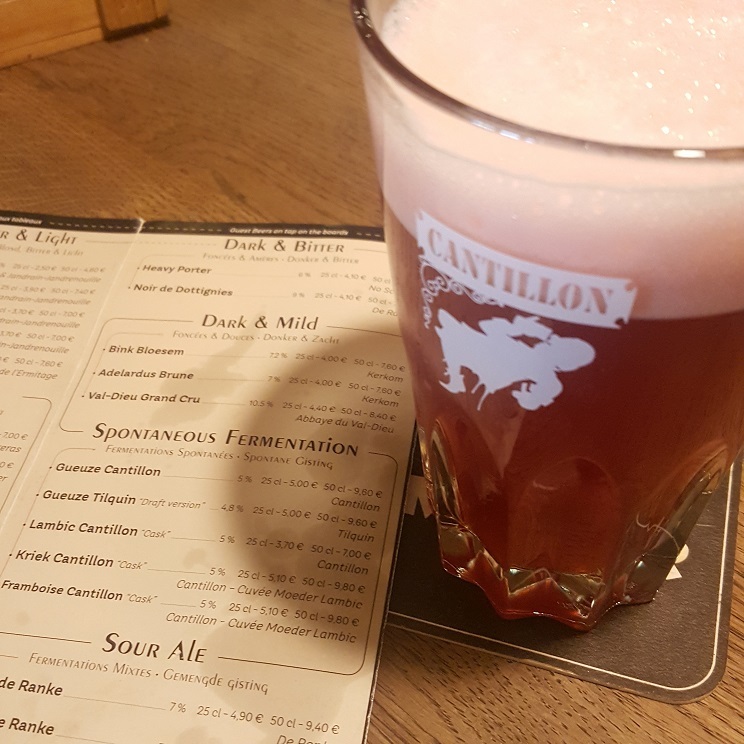 Intro: A 250ml pour from the cask at Moeder Lambic Fontainas into a Cantillon Gueuze glass. 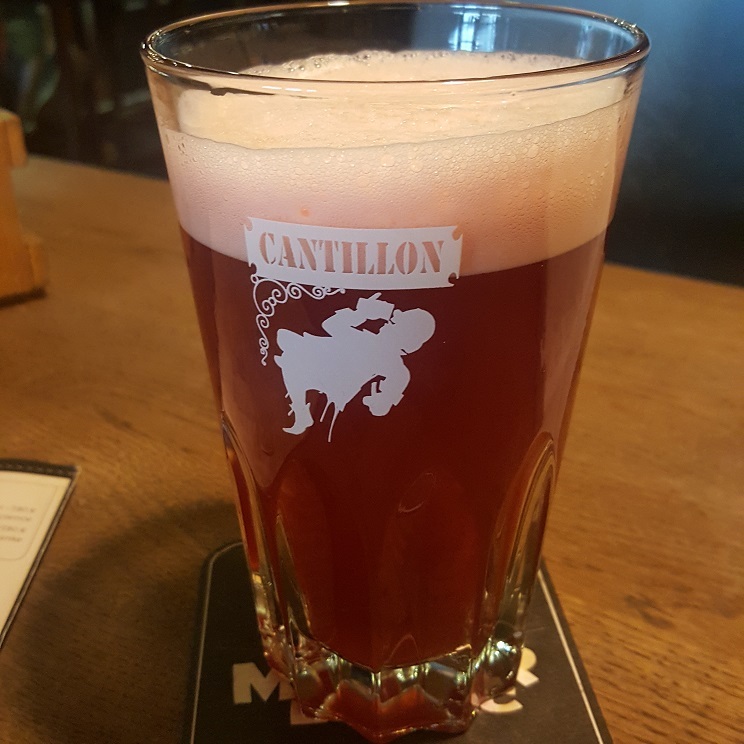 Appearance: A hazy dark ruby red colour with an almost two finger frothy pink head that had pretty good retention and left some lacing. Aroma: Cherry, almond and marzipan. Taste: Sour, tart, cherry, almond, marzipan and a touch of lime. Mouthfeel: Light to medium bodied with soft carbonation. Overall: Very refreshing and just so easy to drink. 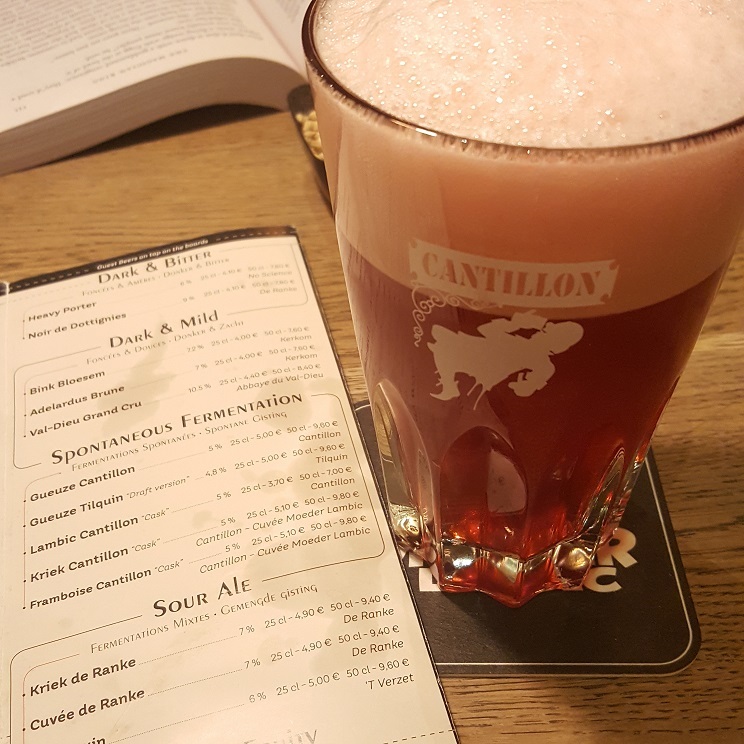 Brewer Description: (from lambic.info) Cantillon Frambozenlambik is a cask framboise served on hand pump at Moeder Lambic and other bars and festivals around Belgium. It is not carbonated, though sparkler tap nozzles are sometimes used to create some head when this beer is poured. Appearance: Ruby red in colour with a big frothy two finger pink head that had great retention and some nice lacing. Aroma: Lightly tart, raspberry creamsicle. Taste: Sour, tart, raspberry and a touch of lime. Overall: Very nice and refreshing.